We like to give real solution to install Cydia application for your iPhone, iPad and iPod Touch. Thousands of our loving users are willing to add cydiainstaller.net to their device home screen. This simple process will help to all users to get most reliable information regarding Cydia application and also jailbreak. If you are interesting with Cydia this will be useful to you. 1. 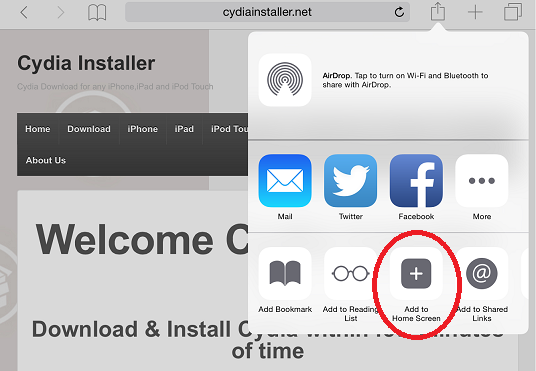 Browse cydiainstaller.net from your Safari browser - - > Tap arrow icon in your browser as appear in the following picture. 3. Tap Add -- > Then you can see cydiainstaller.net with your home screen. This will help to all users to touch with Cydia and Jailbreak. We have seen many users are interesting with us, So this will help to touch us easily with your fingertips. Perhaps you may be new to Jailbreak and Cydia. Some useless information will cause damage your device with many ways. Cydia is free open source software developed by Mr. Jay Freeman. This application installation process will take less than 10 minutes of time. User need to make sure with device is ready to jailbreak.